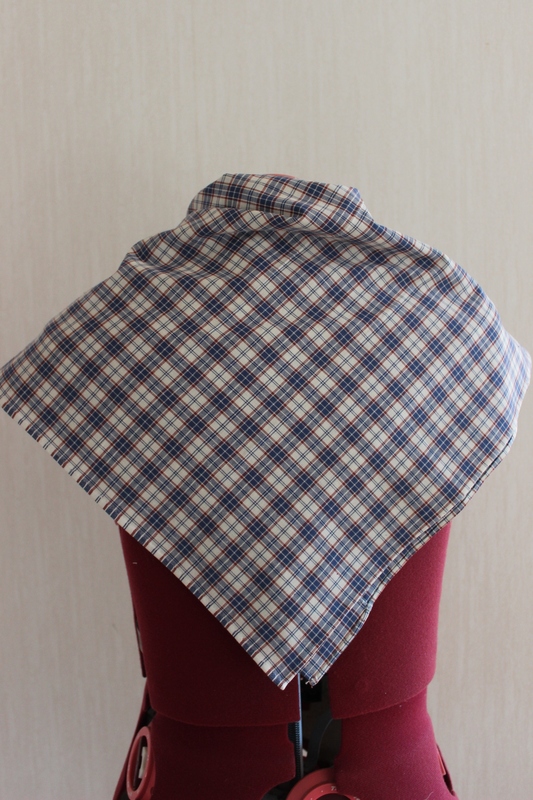 One other thing I made that would fit perfectly into the challenge of “Make-do and mend” for last months HSM, is this simple cotton shawl/neckerchief. 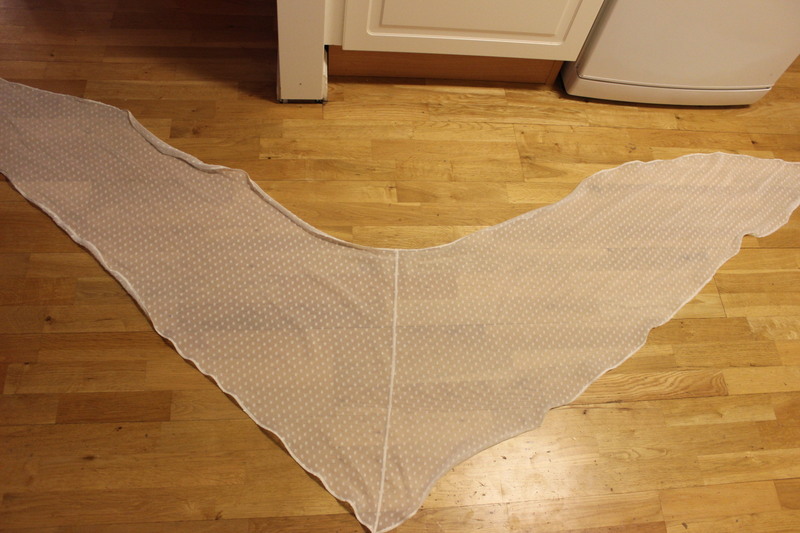 It started out as a small piece of rectangular fabric (50 x 140 cm) that I got for 10 sek (1 Usd) at a estate sale last summer. 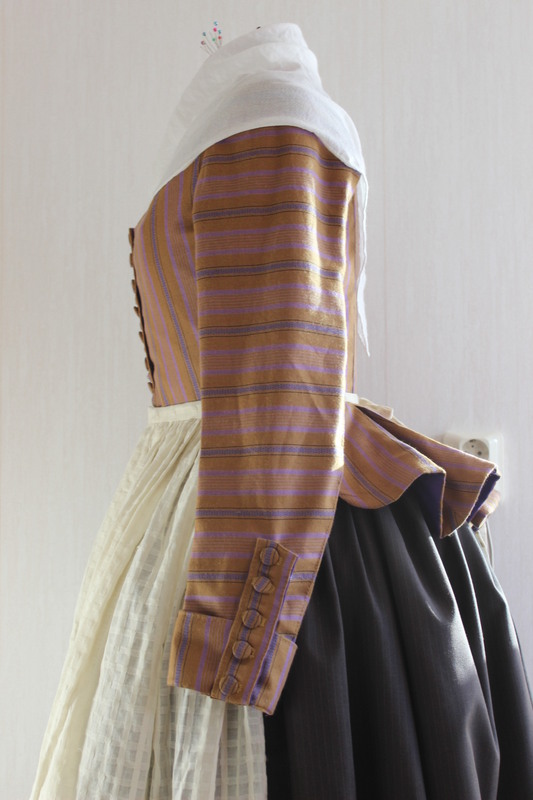 It reminded me of lots of Swedish folk costumes and fabrics worn by my peasant ancestors back in the day. 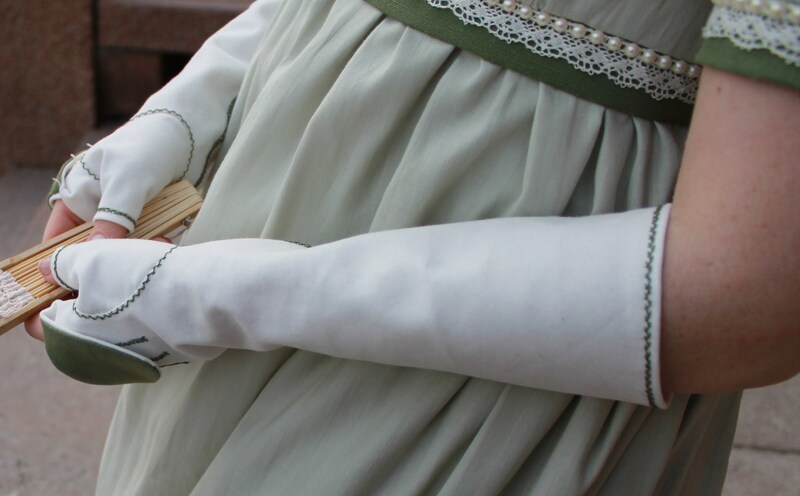 I knew I wanted to make something that could be paired with outfits from 18th century all the way through to the 1920s. 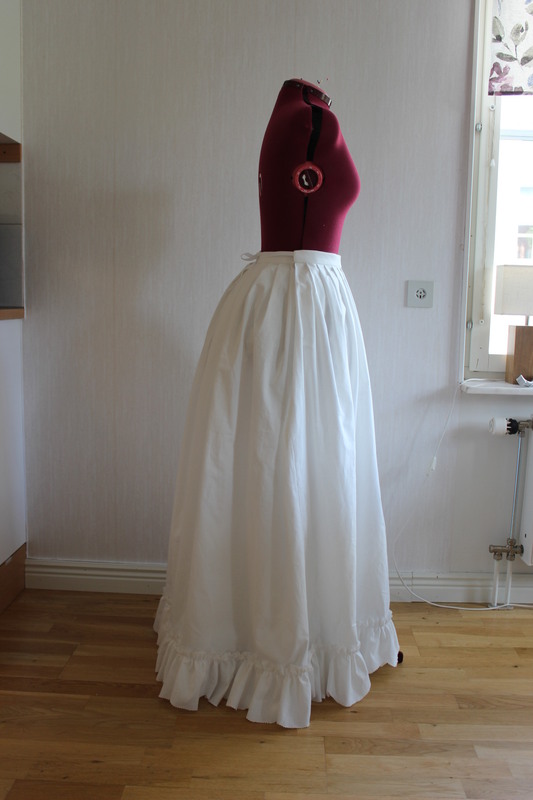 But what? 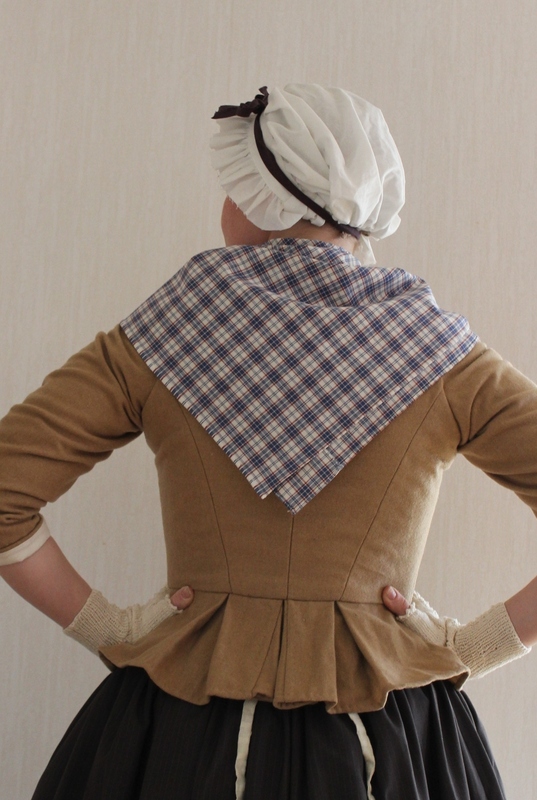 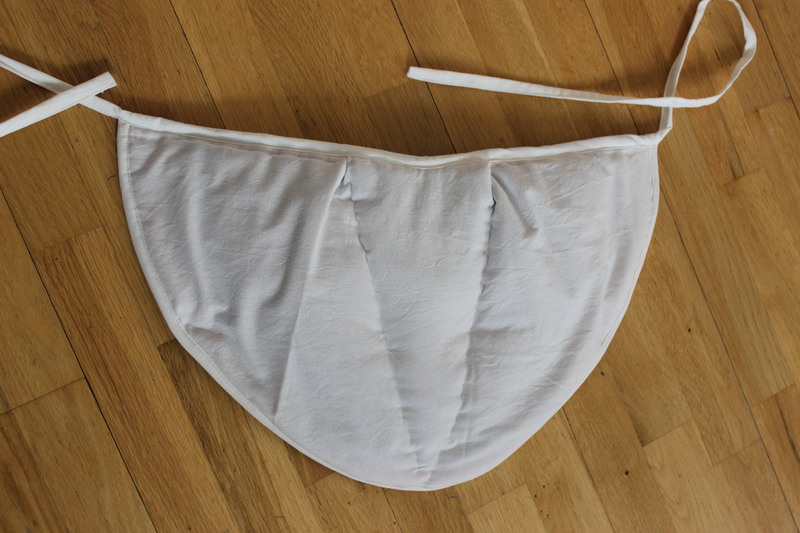 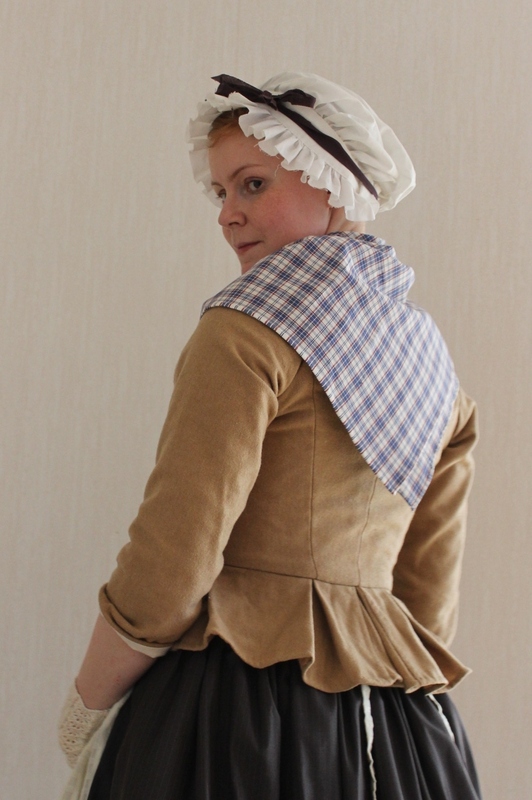 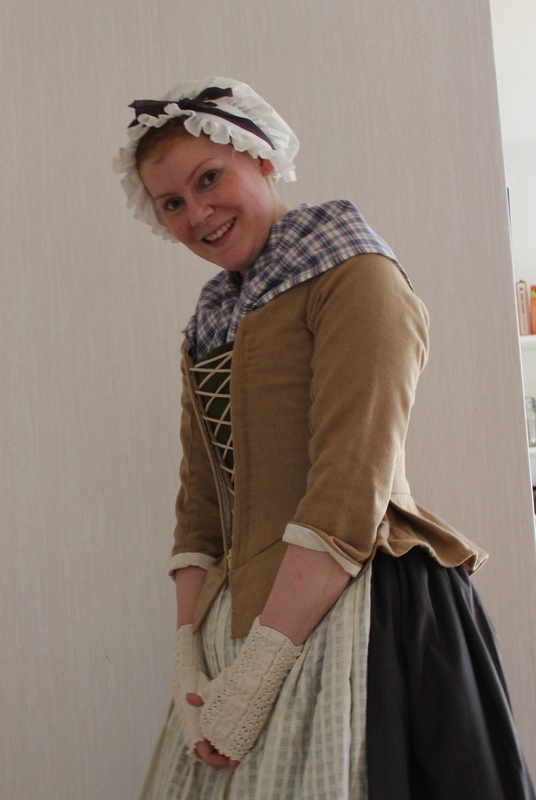 It was the small amount of fabric (les then 50cm) that made the choice for me – a shawl/neckerchief/fichu, would be perfect. 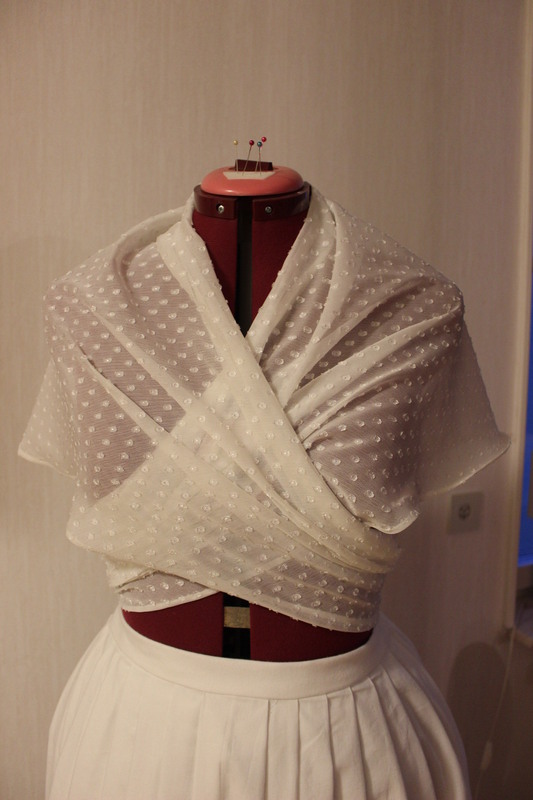 The only problem was the piece was to short to make a proper shawl. 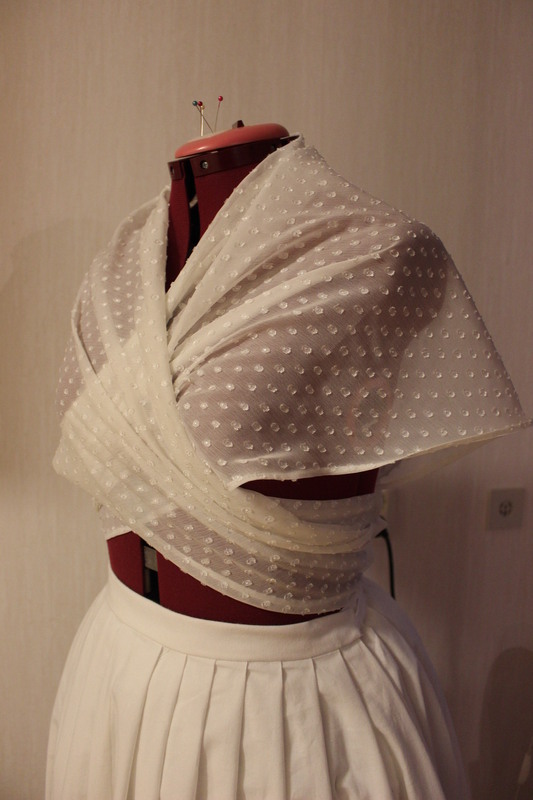 I cut the fabric in 4 different sized pieces and then attached them again to get that biggest size shawl with the least amount of seams possible. 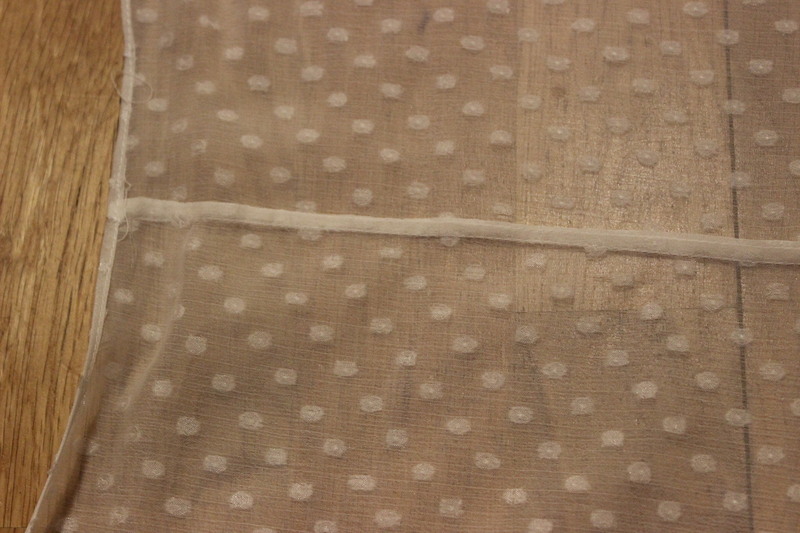 finished but not yet pressed. 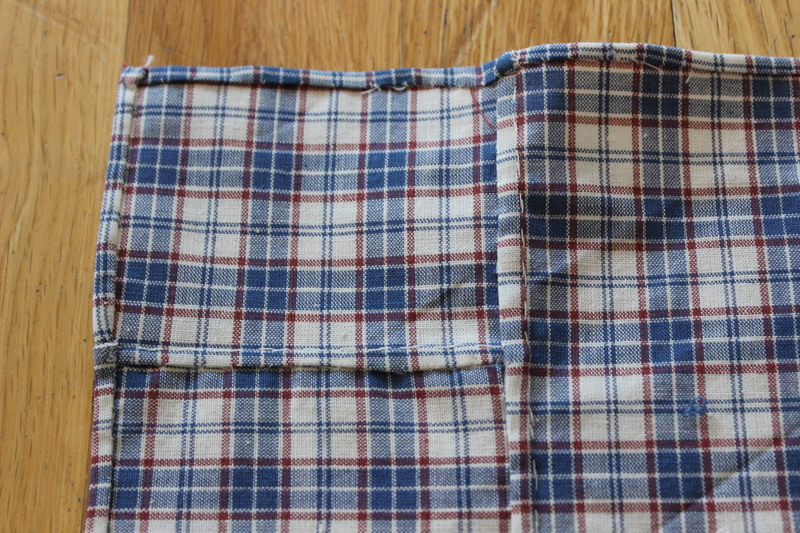 The only thing that I wasn’t completely happy with was the fact the plaid was a un-even, which caused the side-turned piece not possible to pattern match. 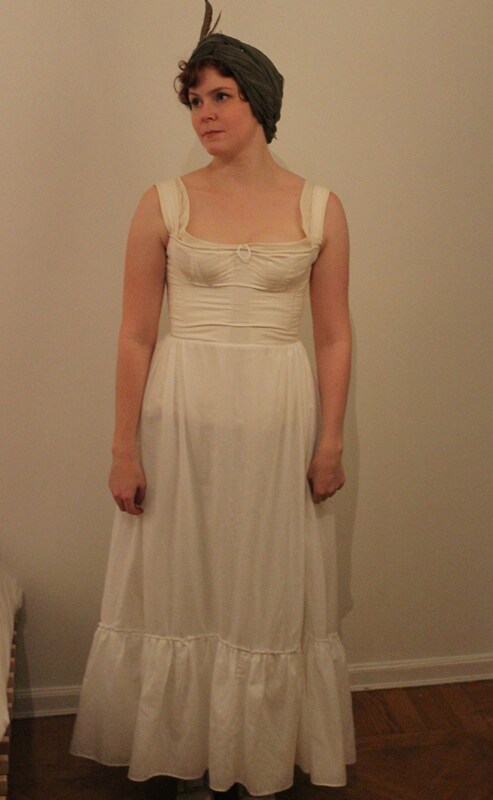 But I don’t think that will be noticeable once worn. 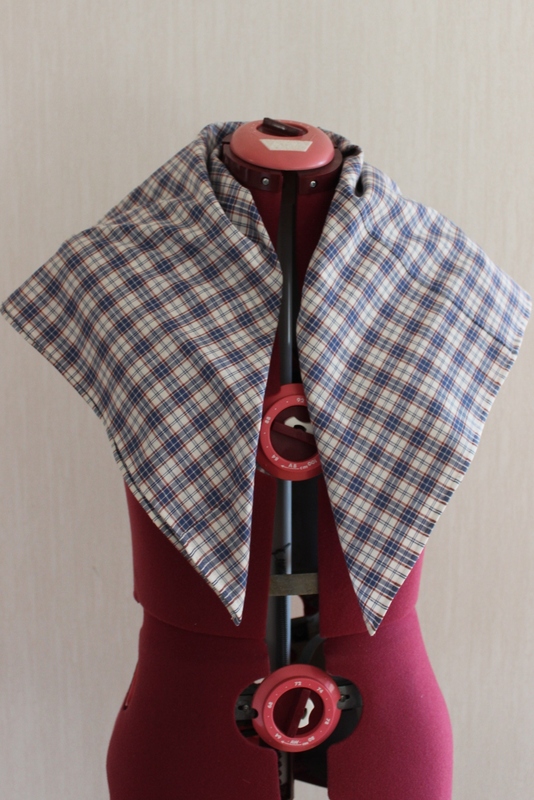 How it fits the challenge: The fabric is second hand from a estate sale, and I pieced the fabric to make a bigger shawl then the original fabric. 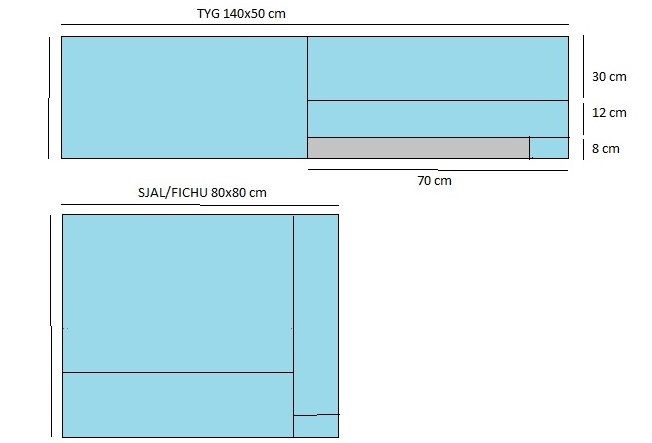 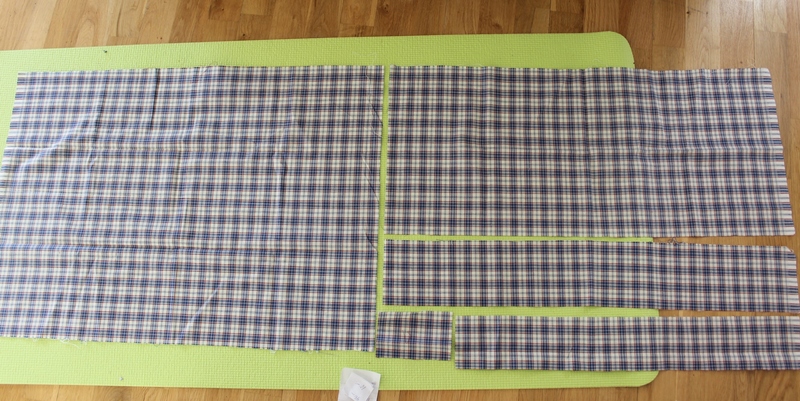 Pattern: None – just made some quick calculations. 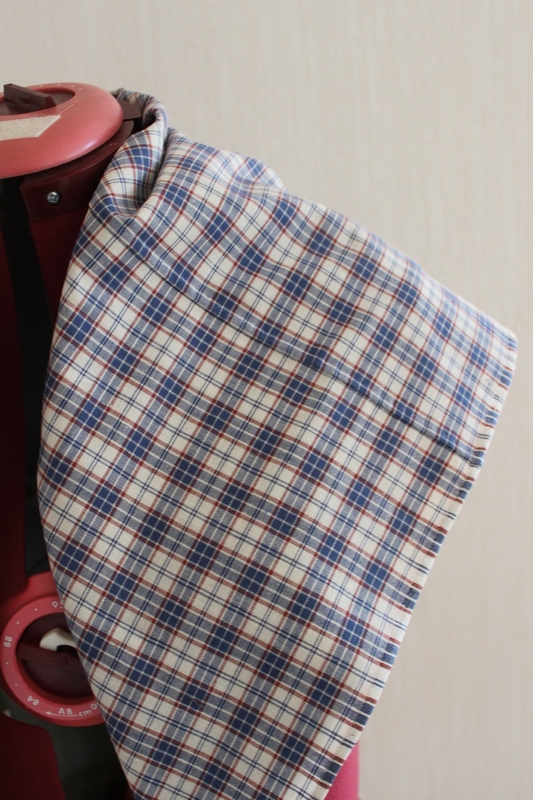 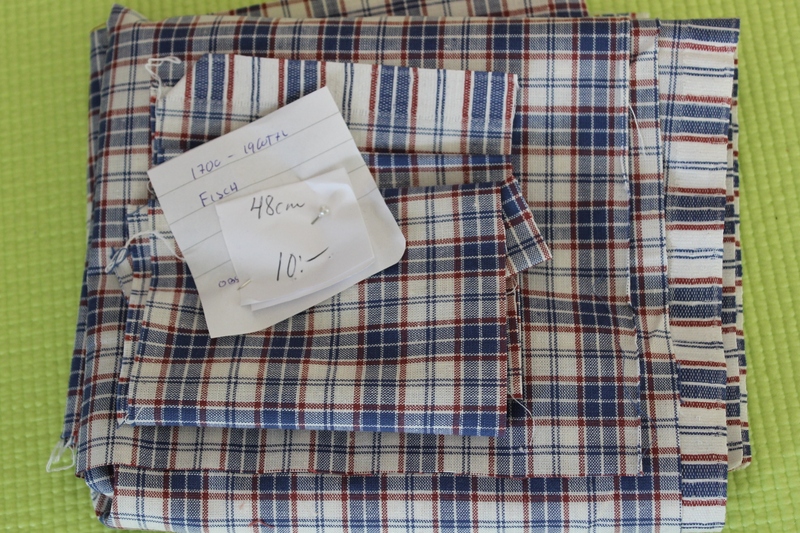 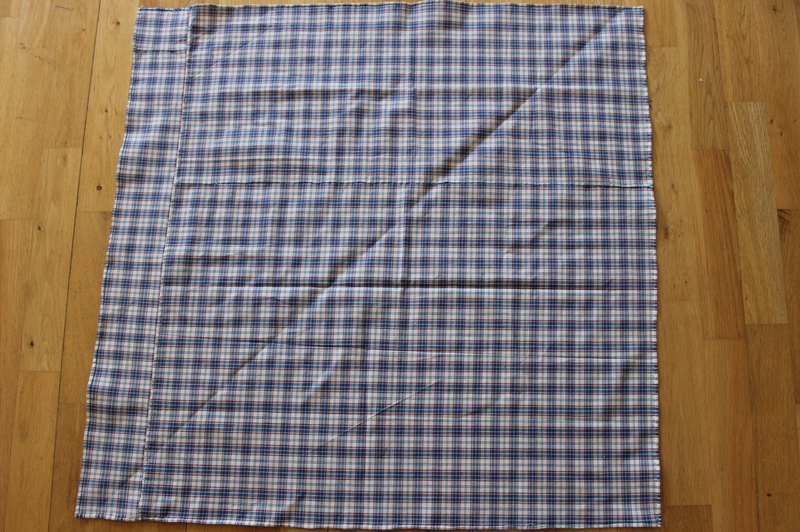 Fabric/Notions: 70 cm blue/white plaid cotton fabric and thread. 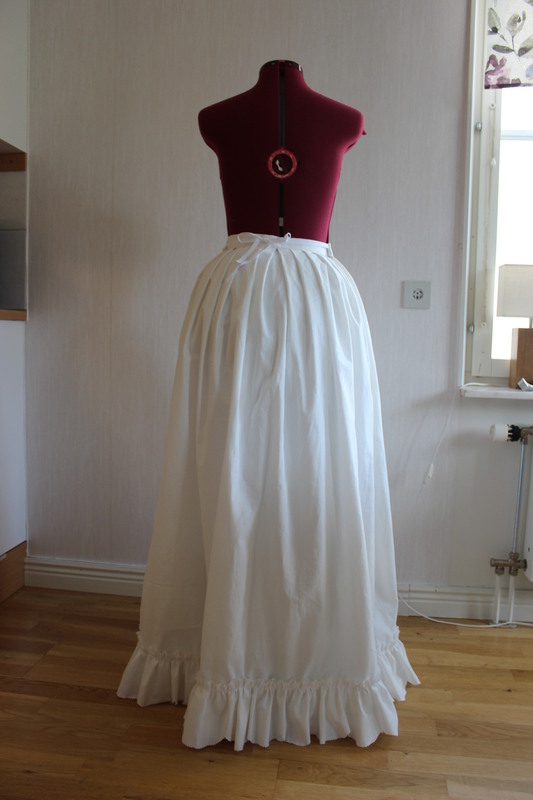 Time/Cost: About 15 Sek (1.5 Usd), and 3 hours. 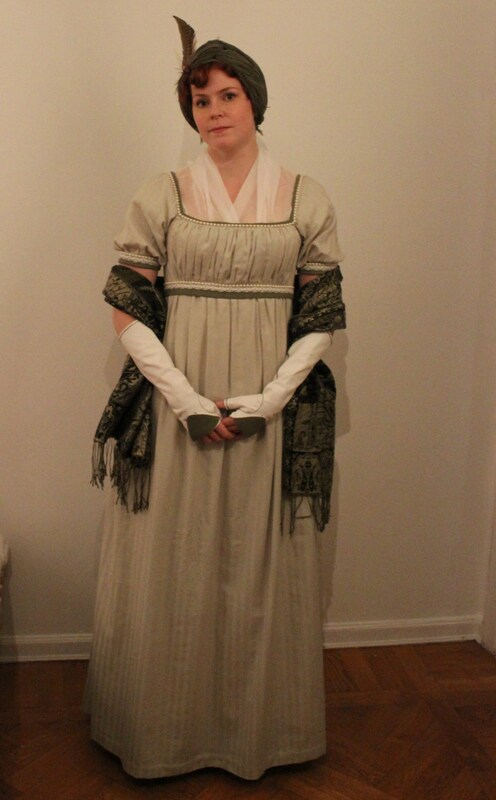 How historical accurate: Spot on I think :-). 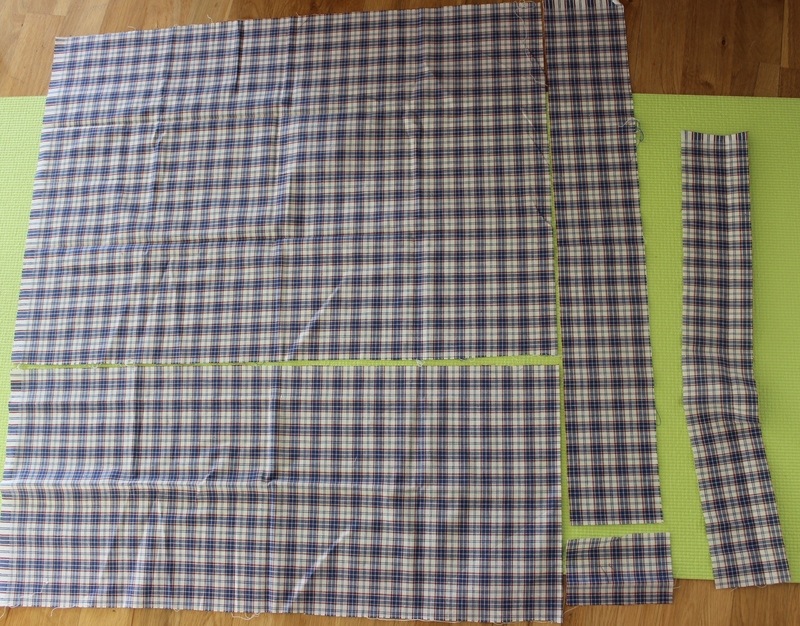 The material and weaved in plaids are good, and so are the stitching with waxed linnen thread and the fact that I pieced together a bigger piece from a smaller one. 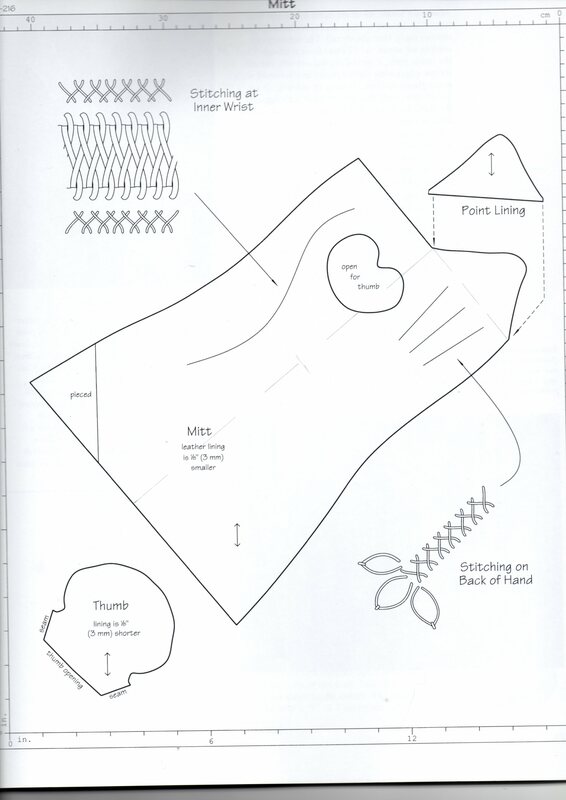 Final thoughts: I think it is good, and i will probably get some use out of it being so simple and non time specific. 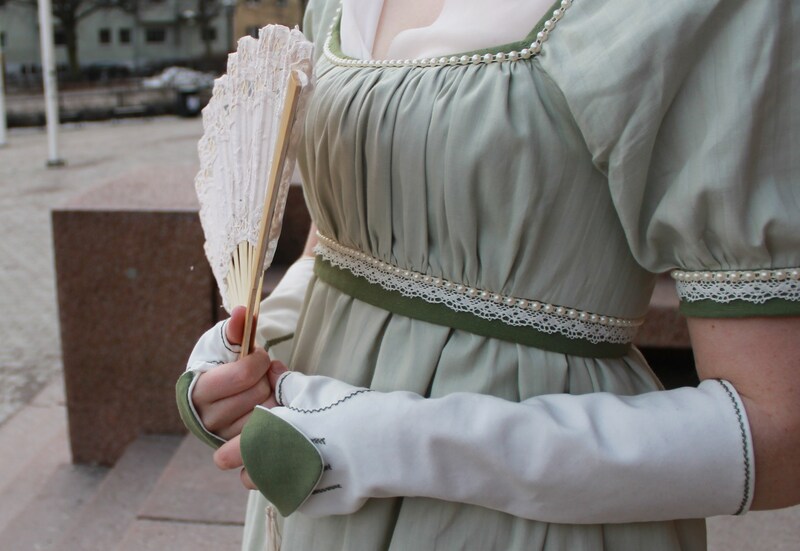 The days leading up to my planed “18th century Maid“photoshoot, I worked on getting all those small items and accessories in order. 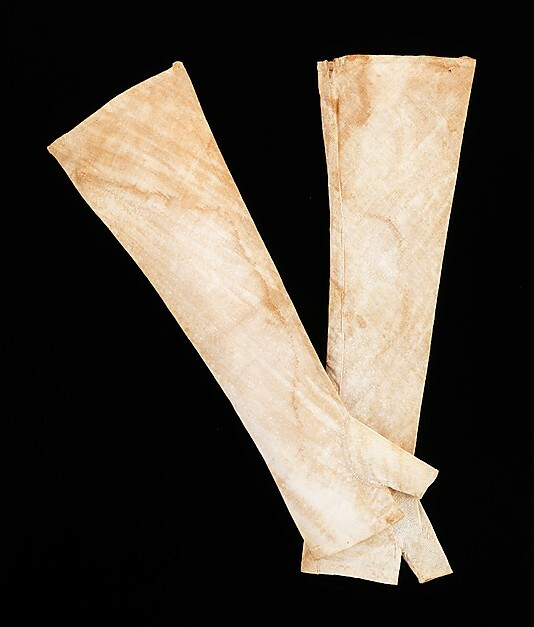 The leftovers from the jacket (part 1. 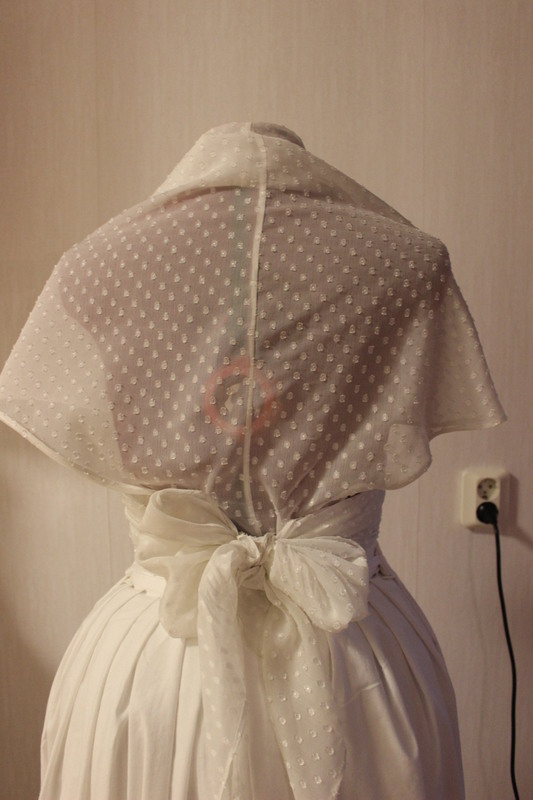 & part 2.) 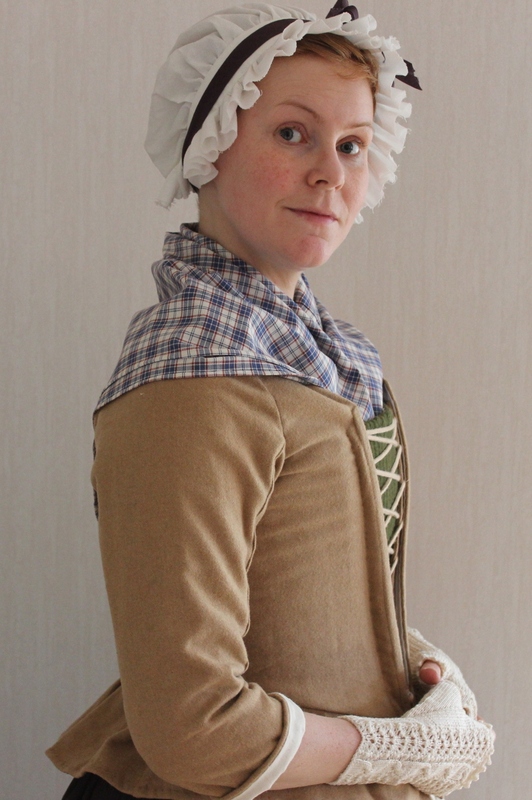 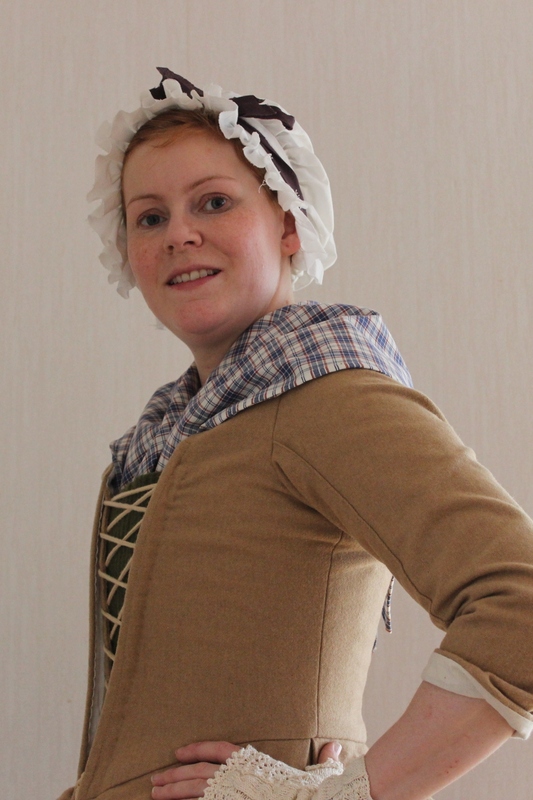 I turned into a simplified version of a 18th century pocket. 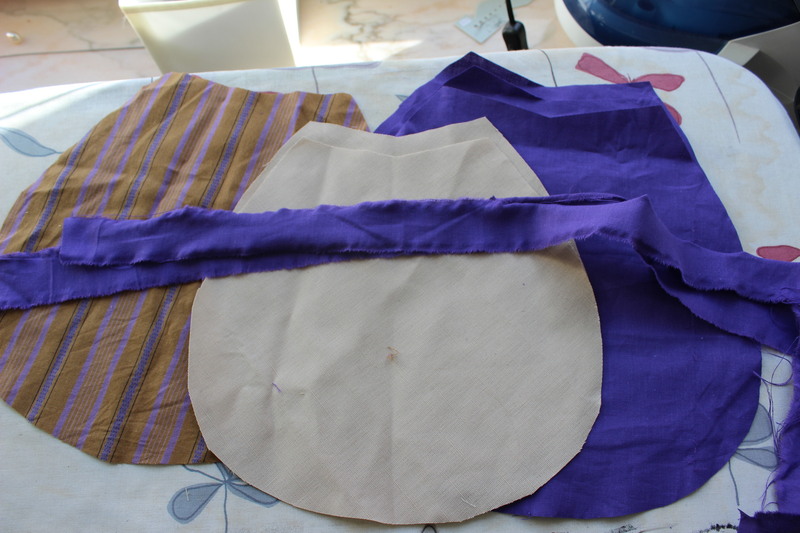 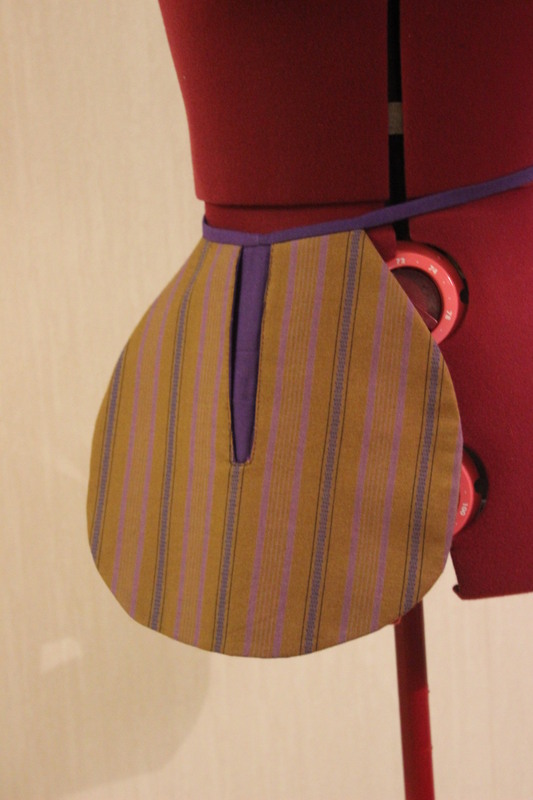 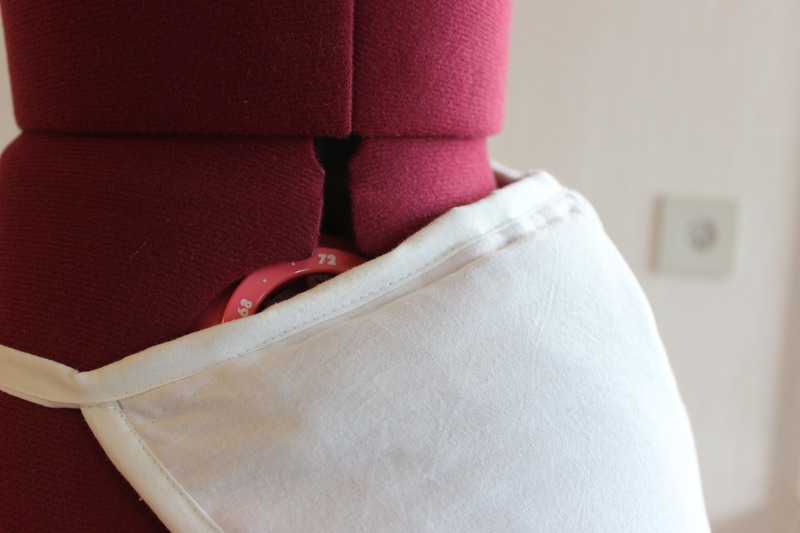 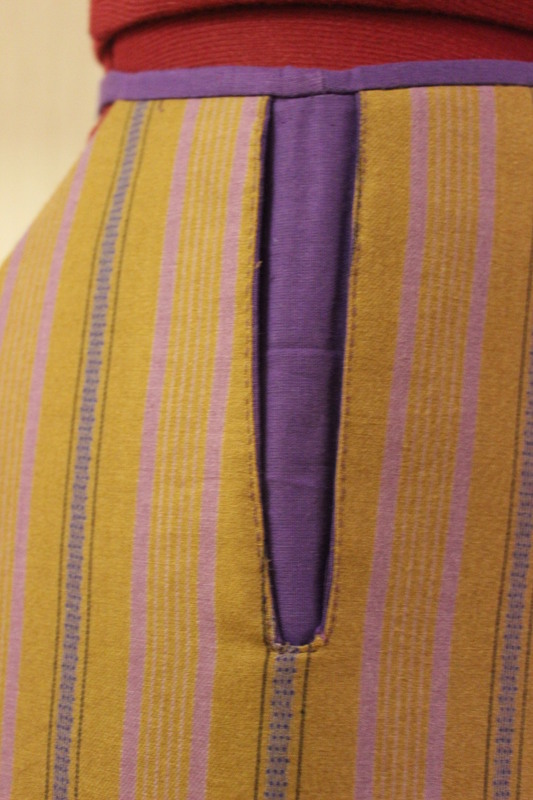 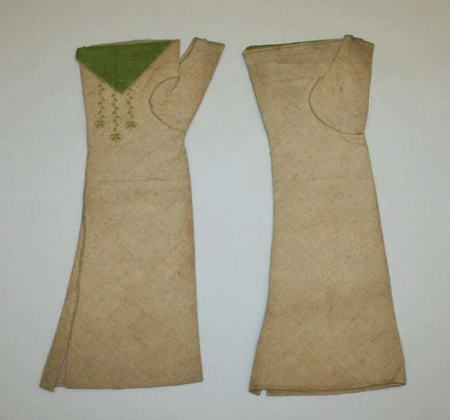 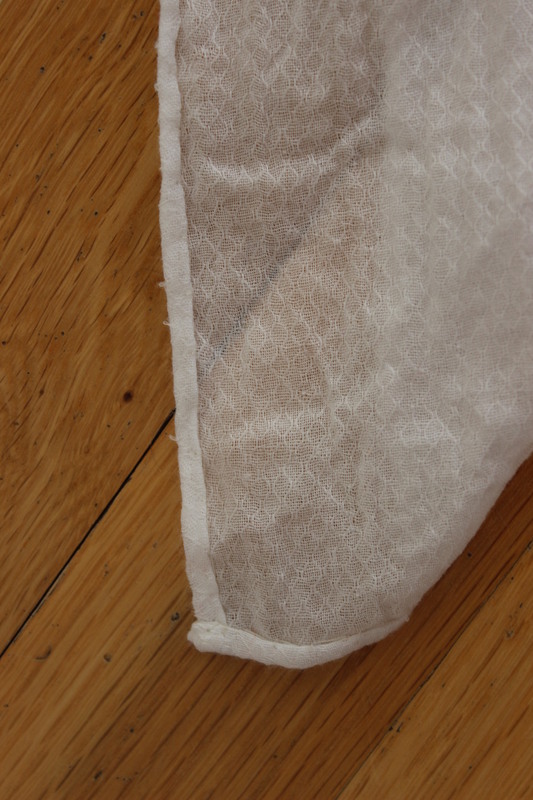 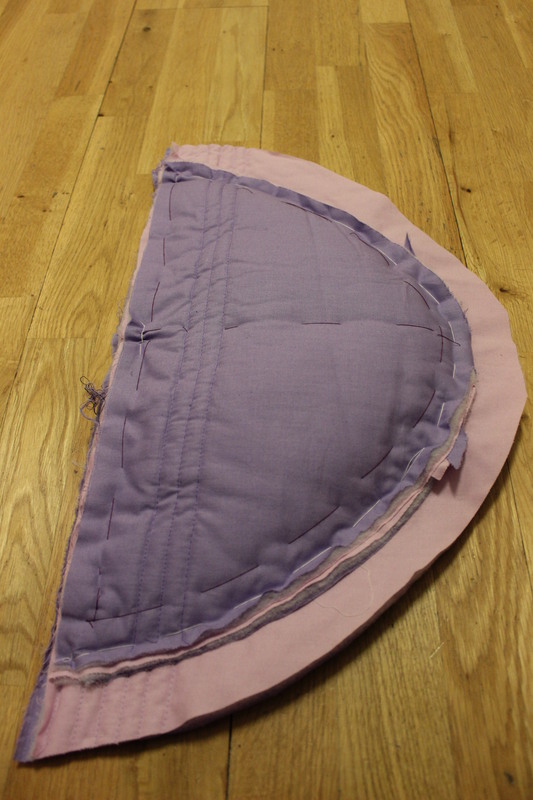 Cutting the pieces in front, back and strength fabric – all of which was almost unusable scraps to begin with. 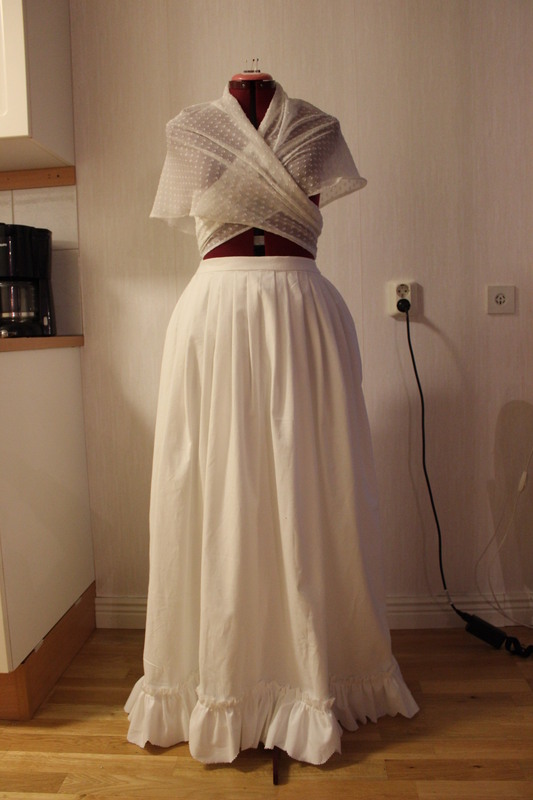 It was such a quick project (took about 2 hours, once I figured out how I wanted it). 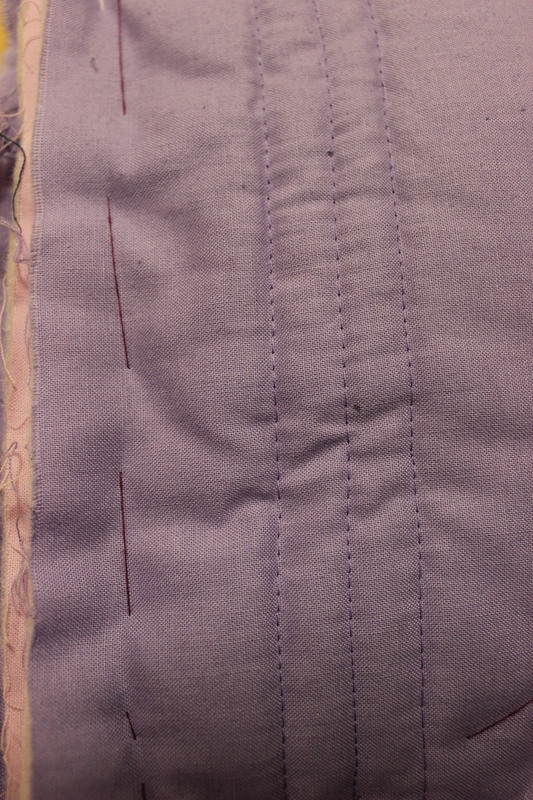 In hindsight I should have made bias tapes for the opening as well, but suppose I didn’t had enough fabric anyway. 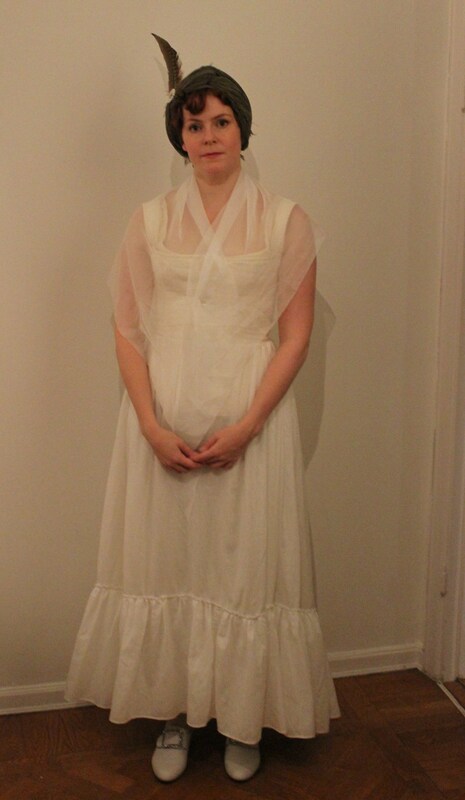 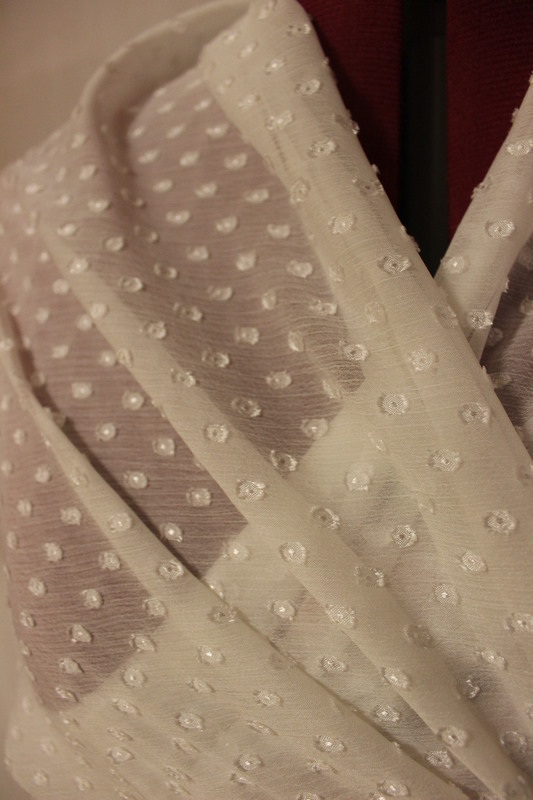 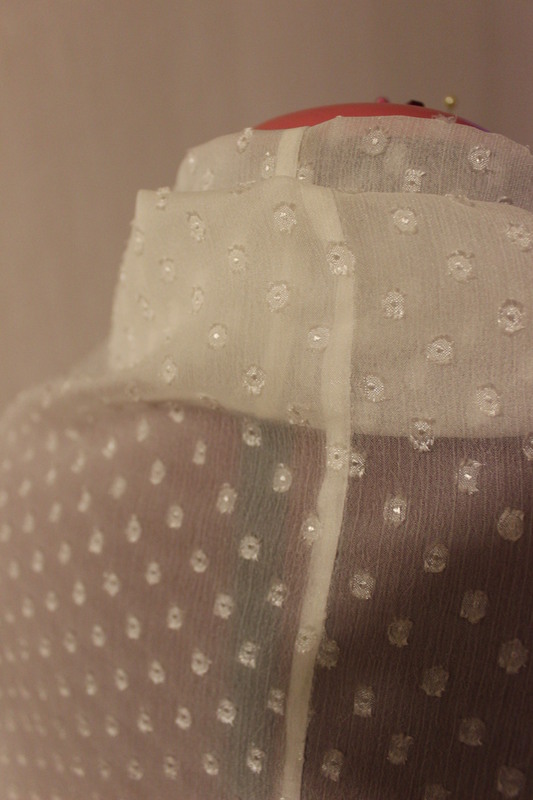 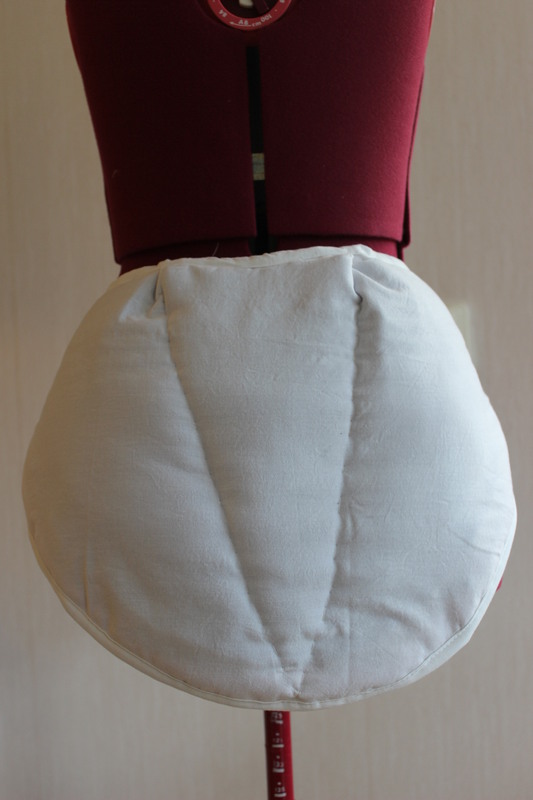 I also made a new fichu, since I wanted something les fancy then my regular silk one. 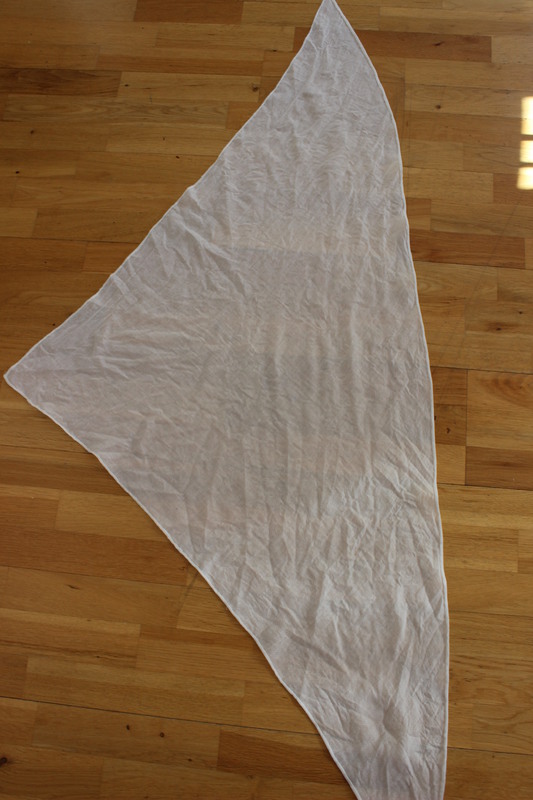 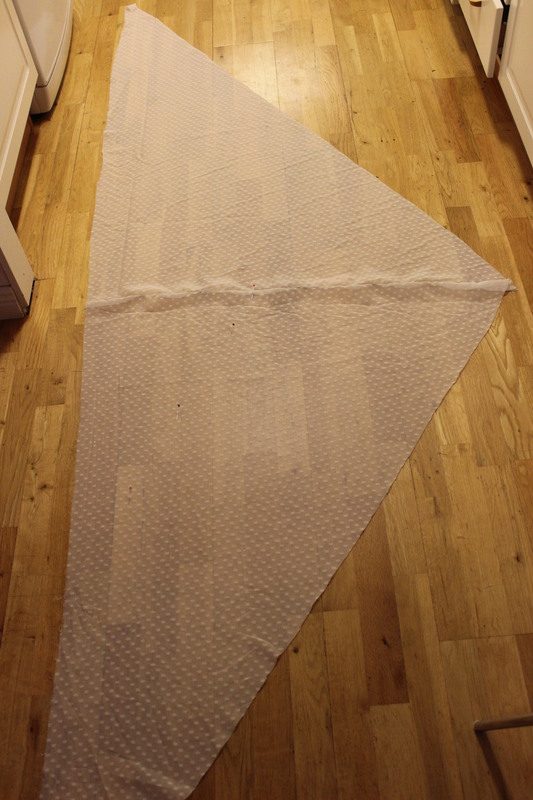 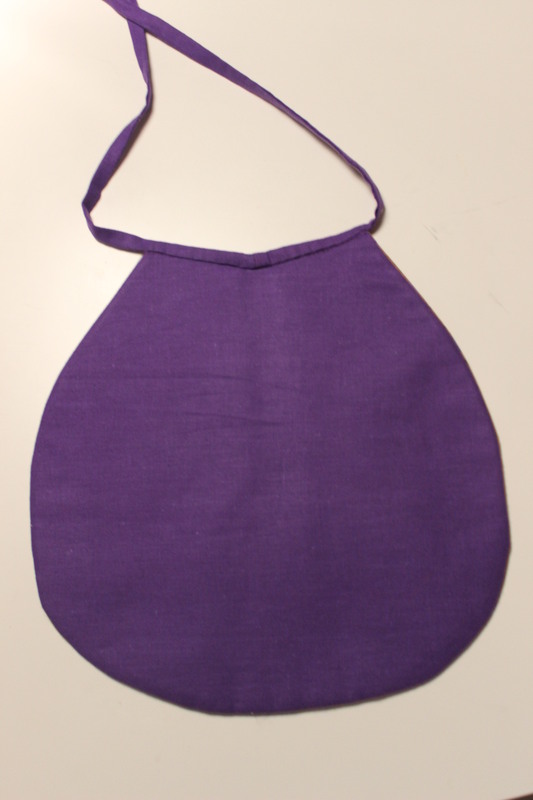 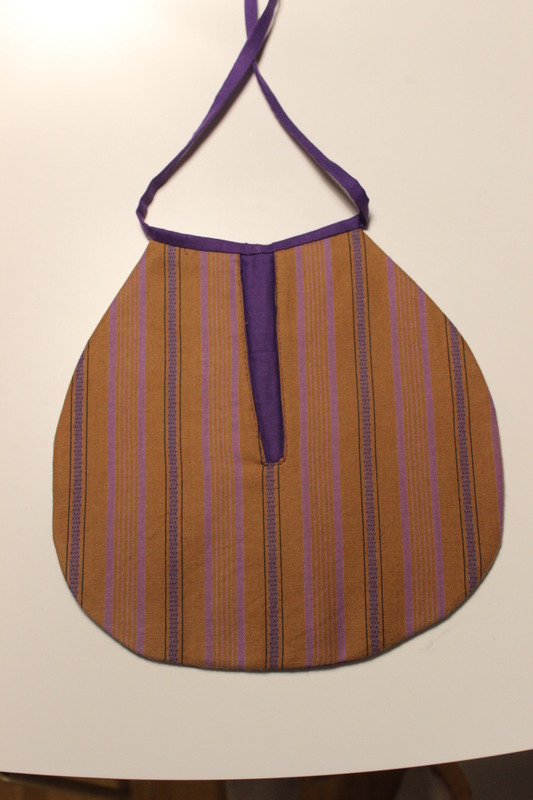 It’s basically a cut triangle, with hemmed edges. 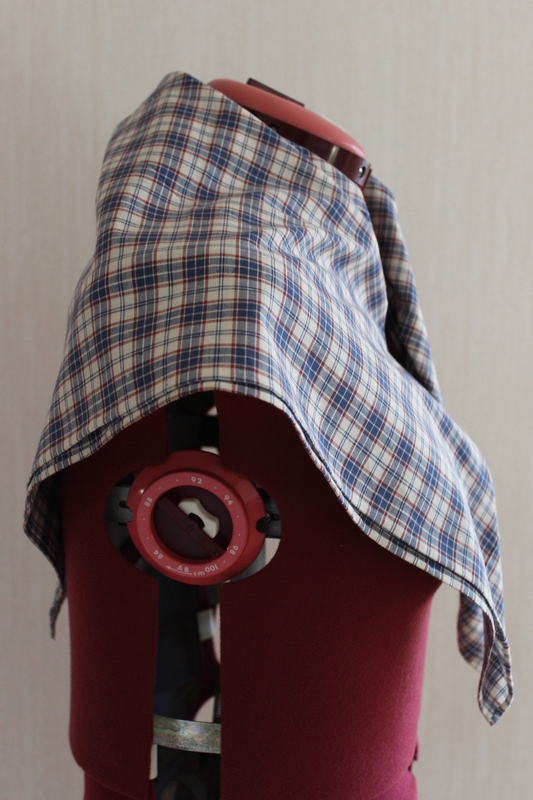 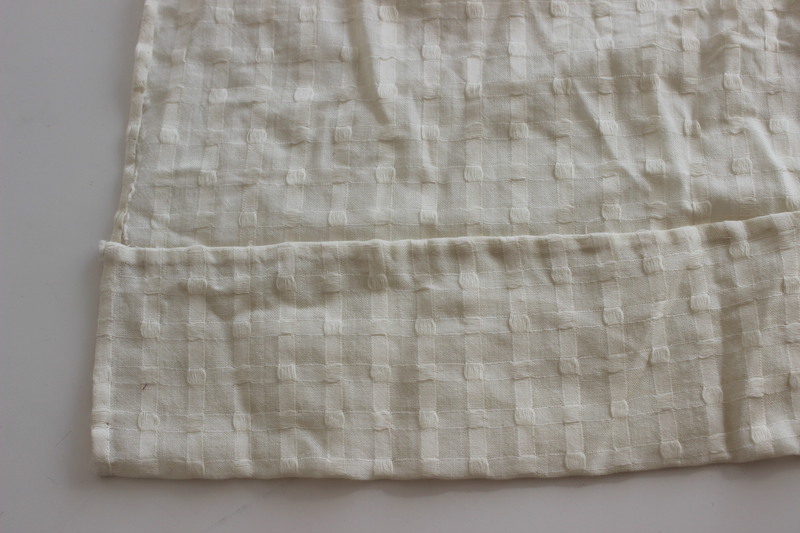 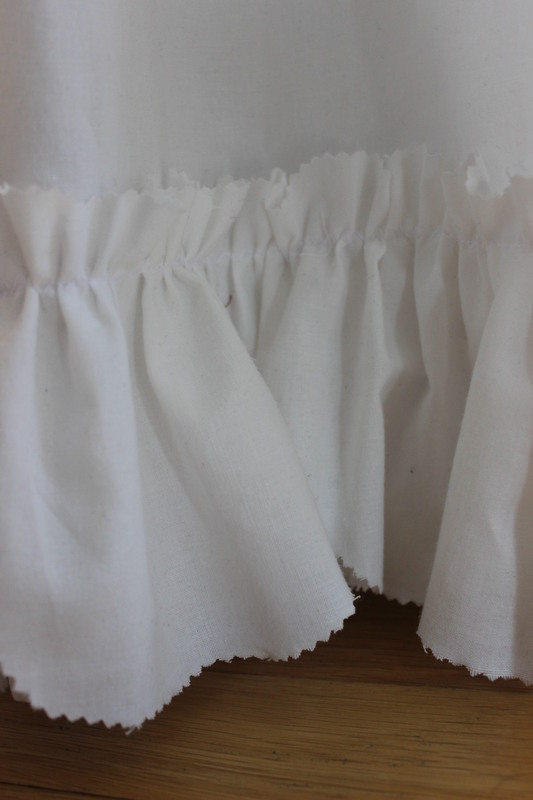 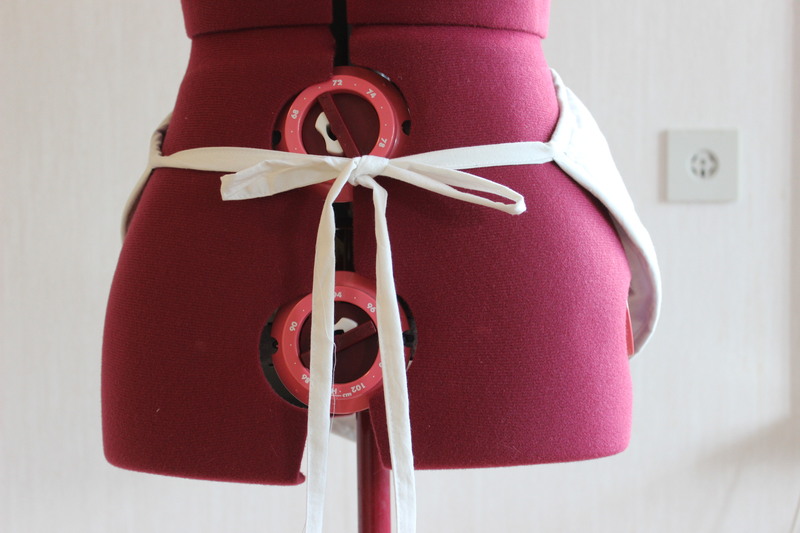 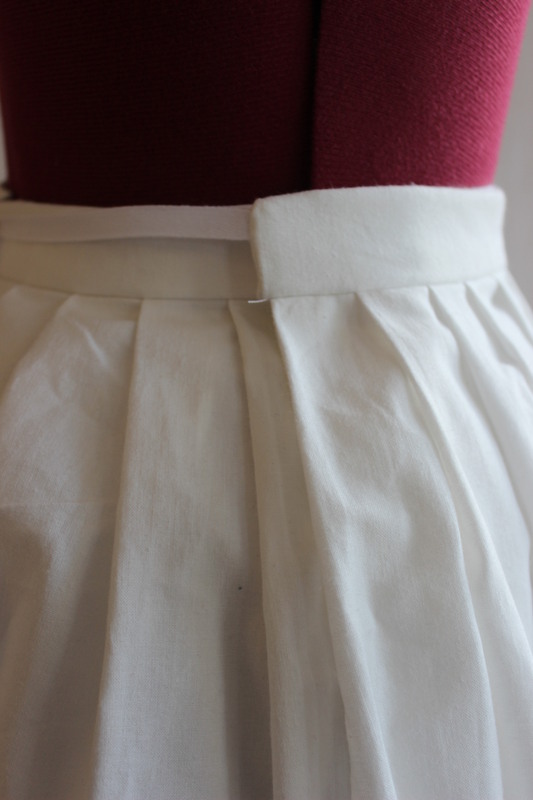 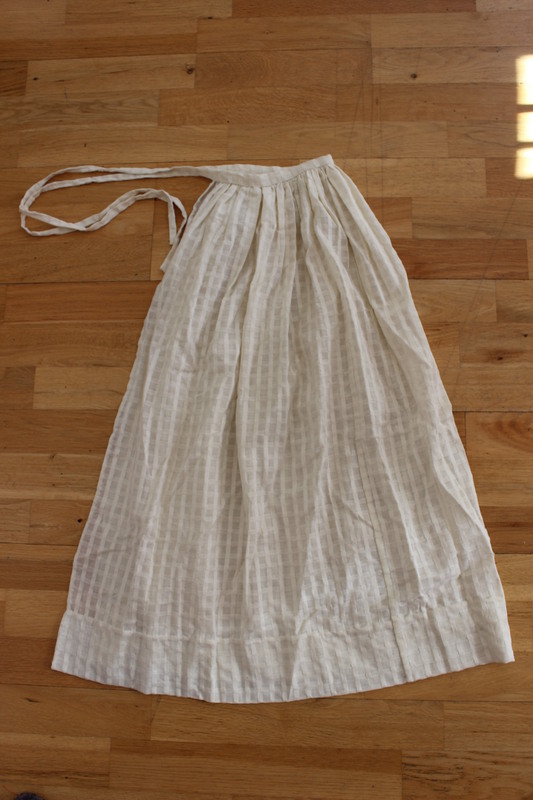 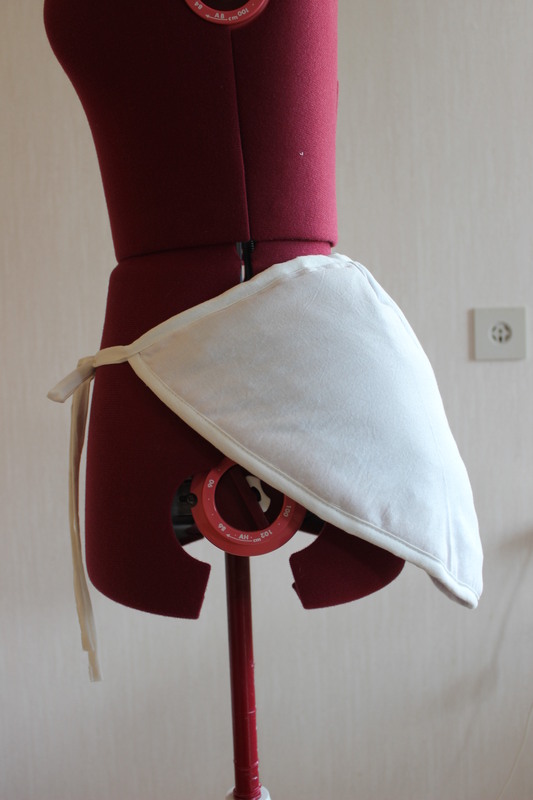 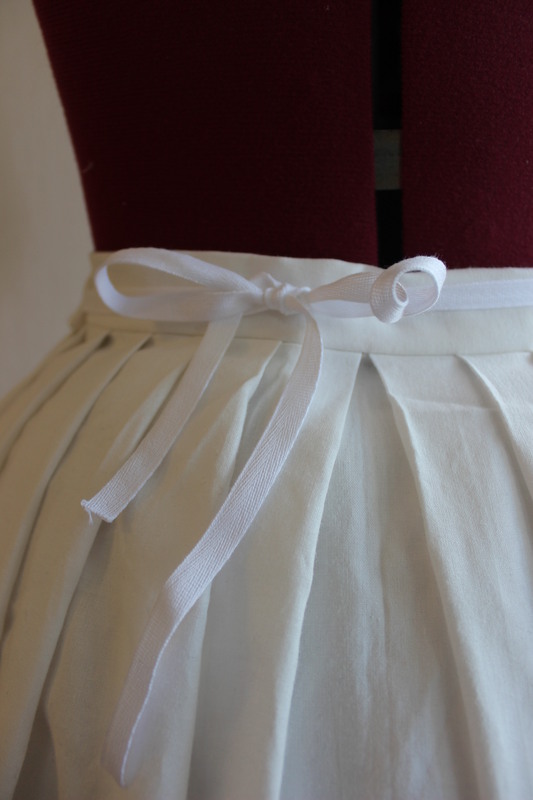 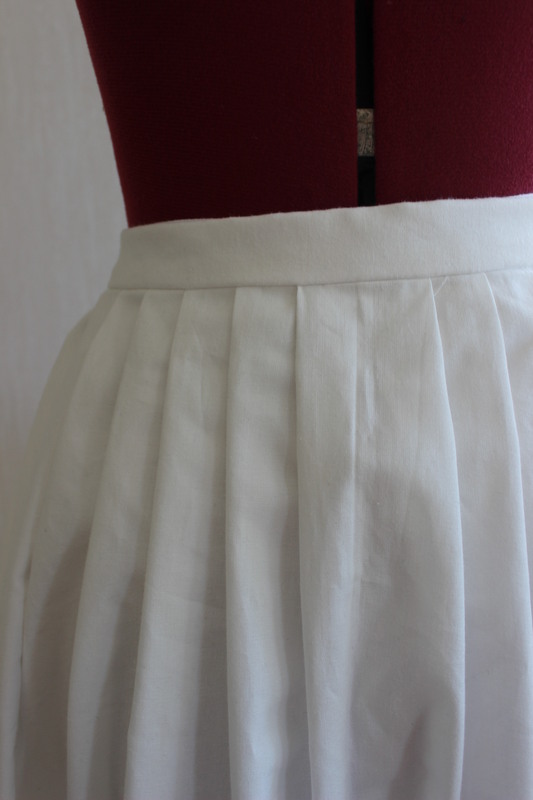 I re-used my white apron, but shortened it about 12 cm to get it to fit lenght of the skirt. 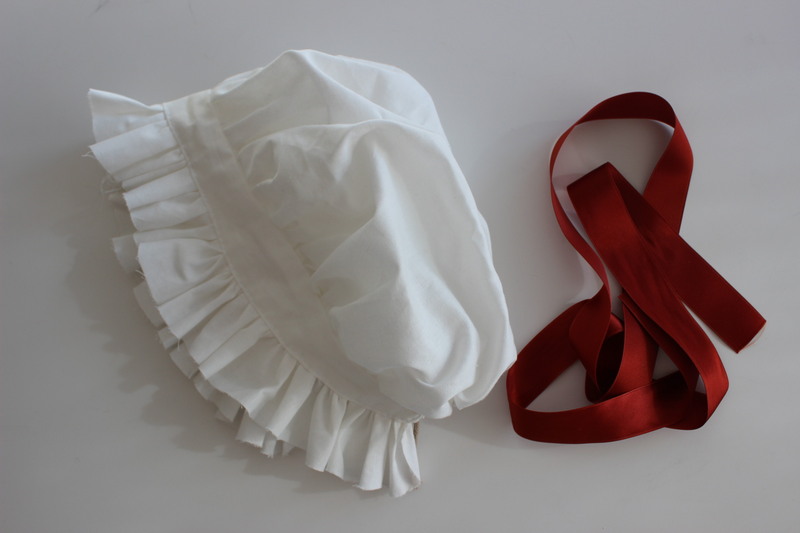 I also used my “old” cap (made it a couple of months ago) paired with a orange/sierra ribbon. 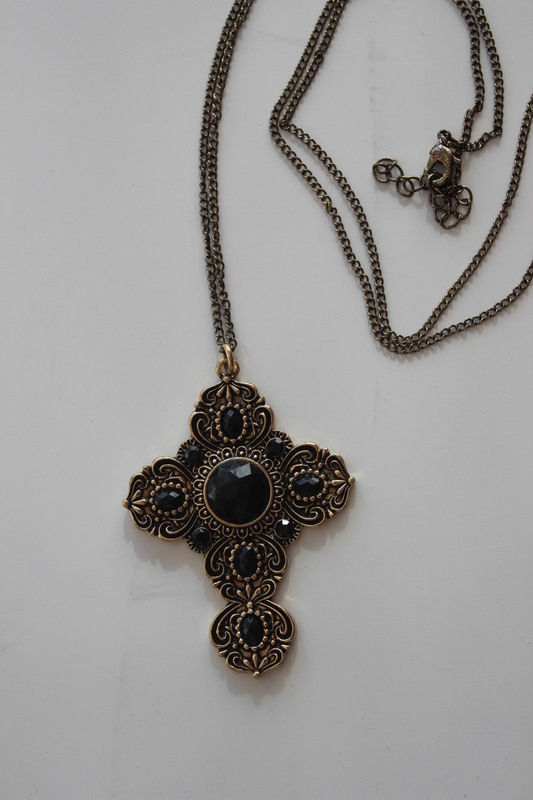 The final touch was to ad a cross, which I bought on sale in January for about 10 Sek (1,6 Usd). 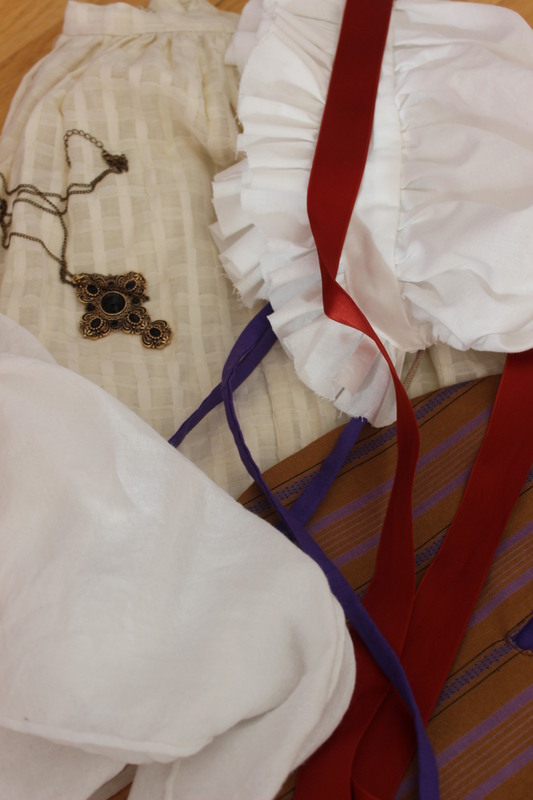 Everything a proper maid will ever need. 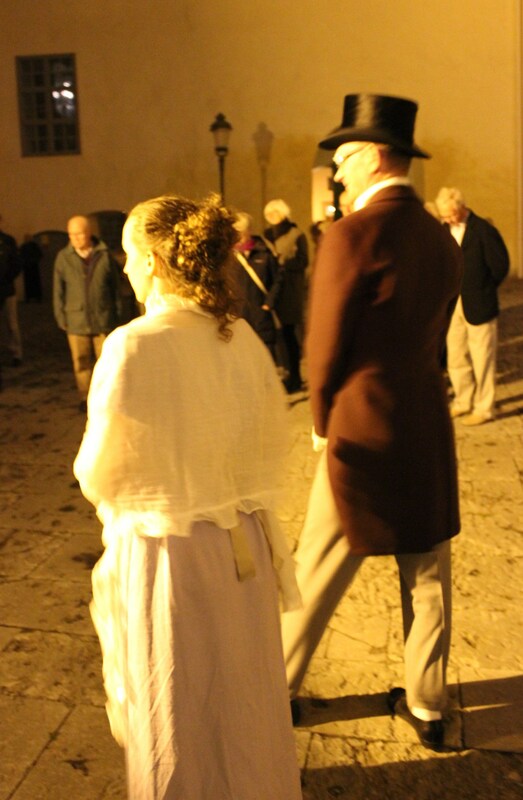 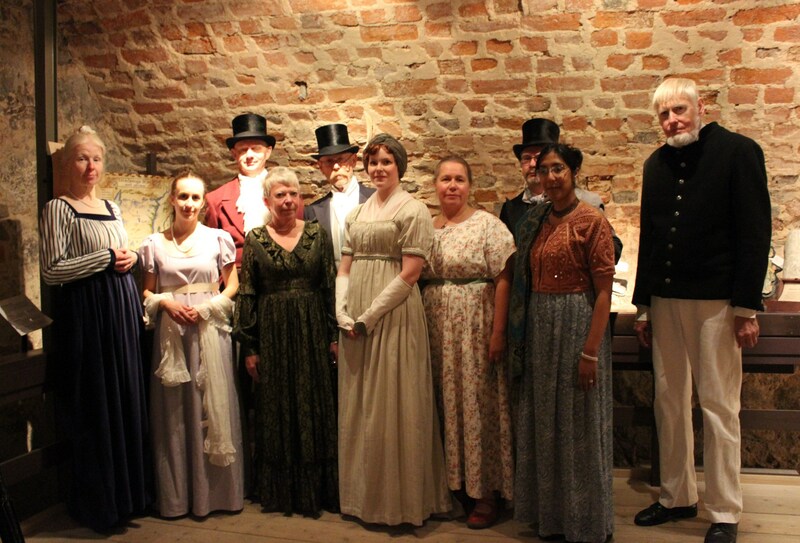 A month ago I got asked to be part of the dancing entertainment on a event the local historic museum were arranging. 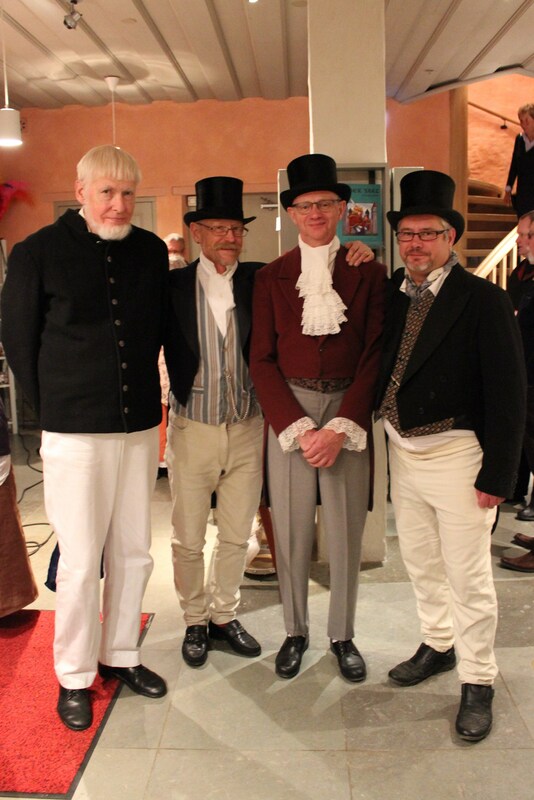 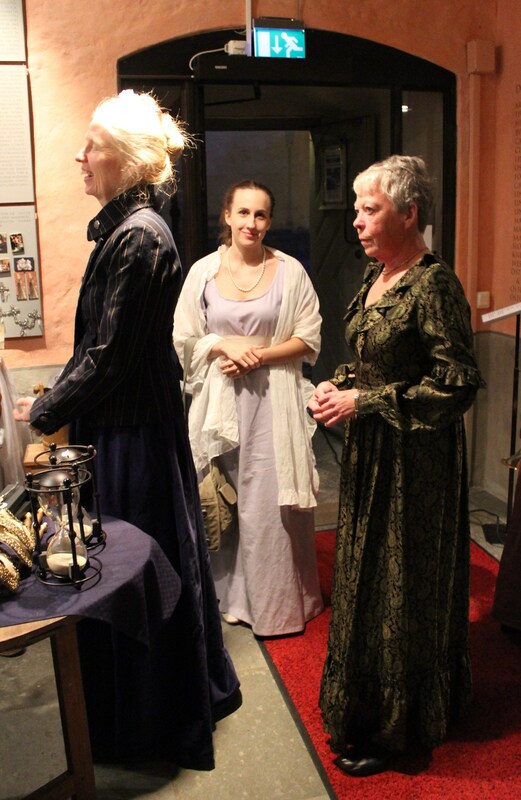 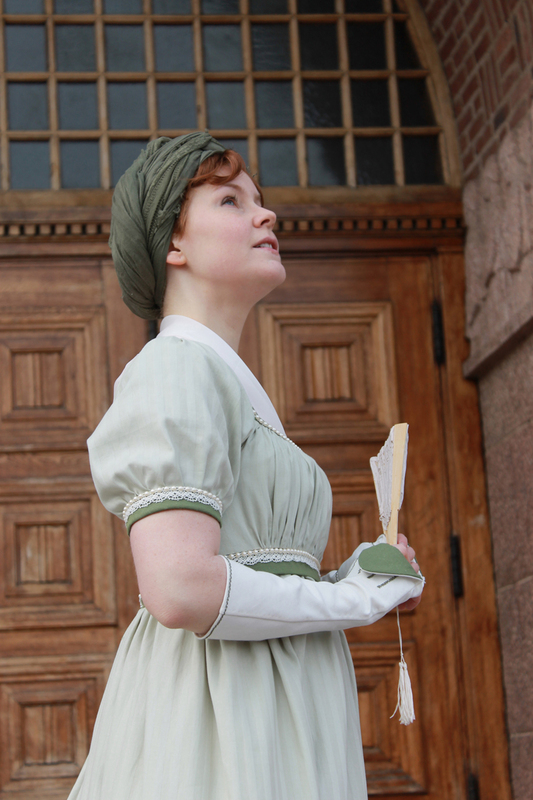 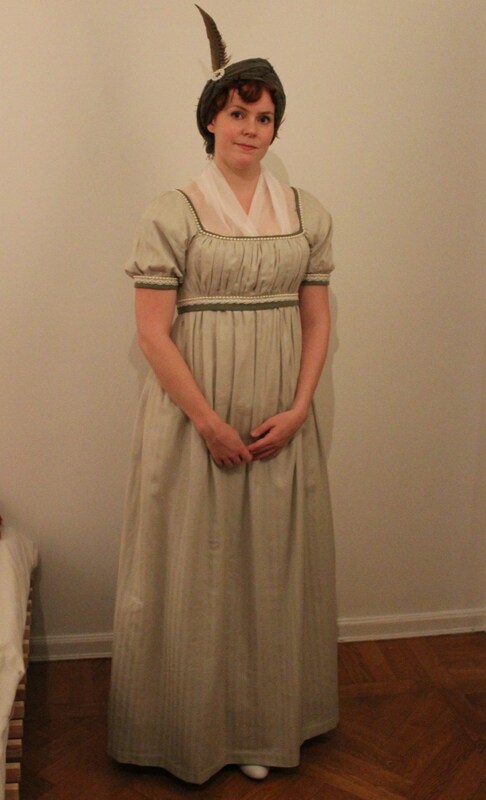 So this weekend (29 sep) I got my regency clothing together and hurried to get to the “on spot” rehersal. 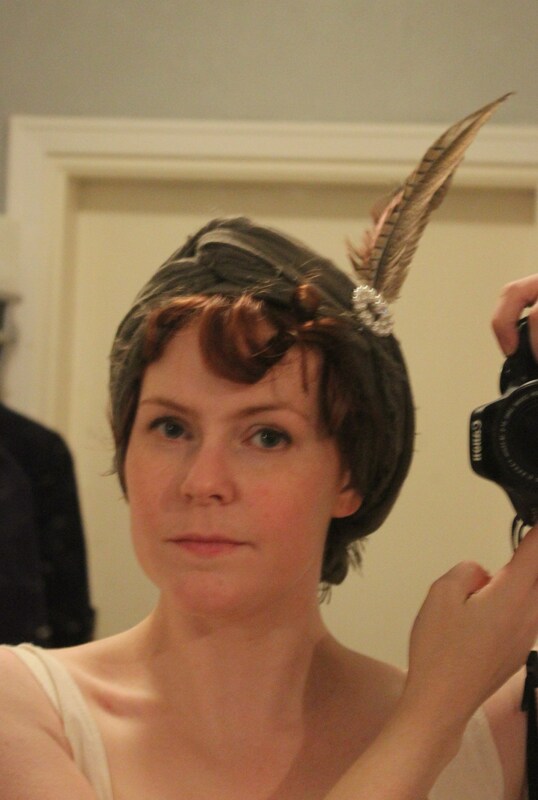 I curled my hair and tied a shawl as a turban, then I attached a brosch and some feathers to get the right regency look. 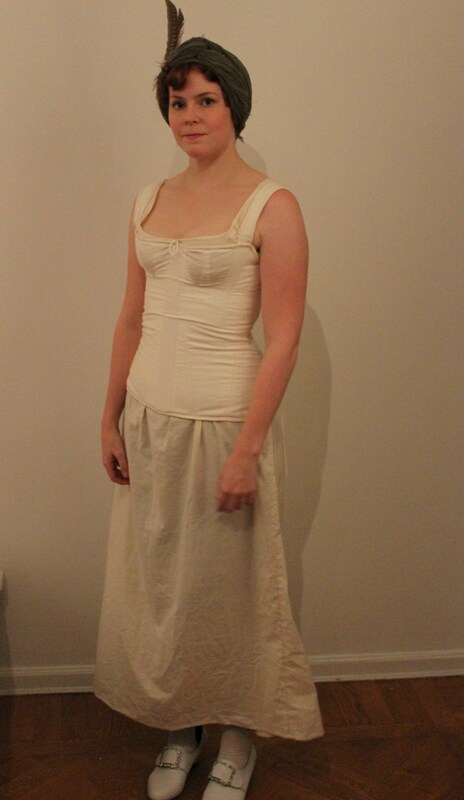 I hurried to lace my brand new corset, put on the petticoat, stockings and mylovely “Kensingtons” shoes from American Duchess. 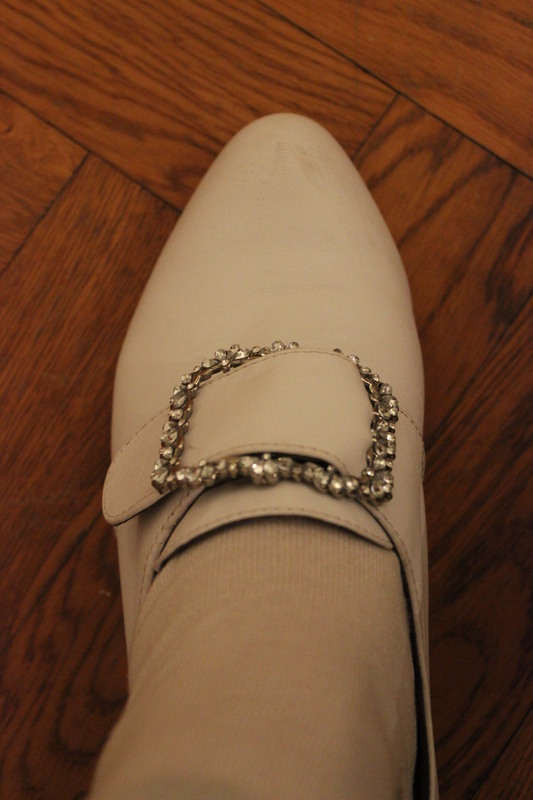 Unfortanley I didn’t have the time to find some ribbons to replace the shoe buckles with. 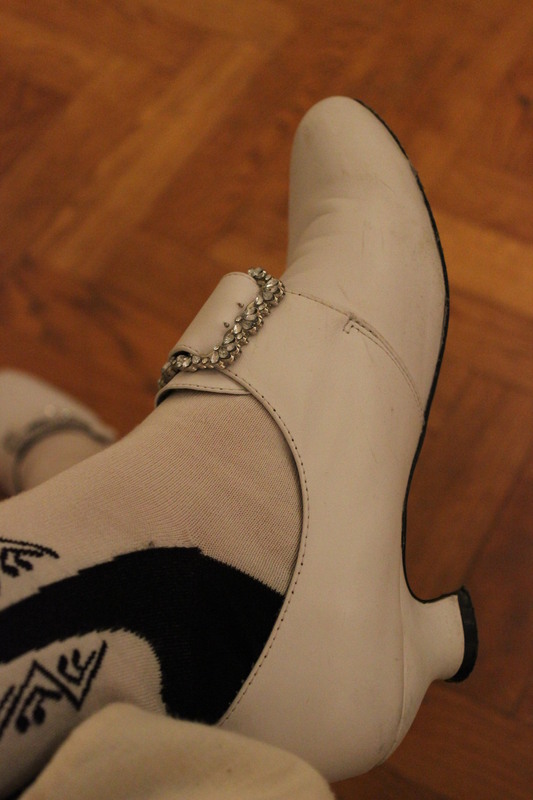 Although 20 years wrong in the time period they do look beautiful. 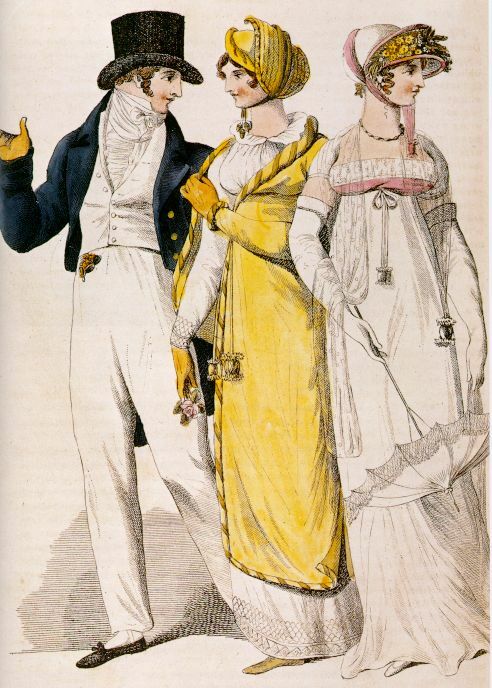 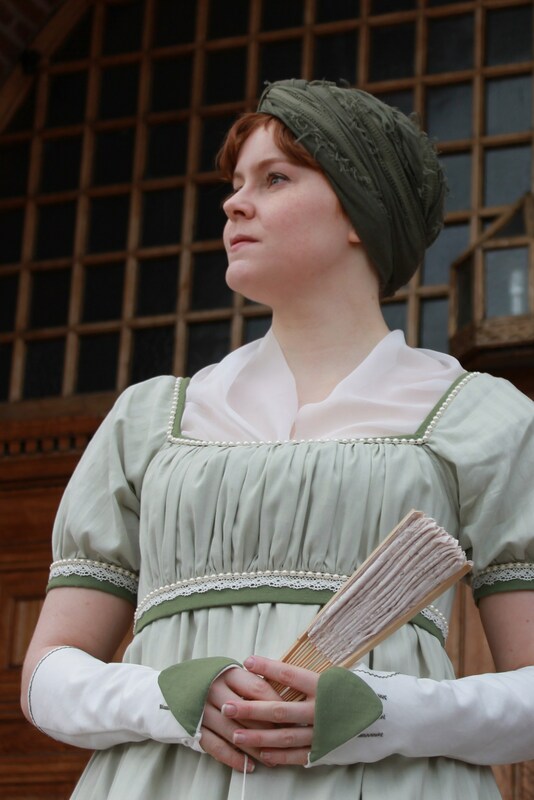 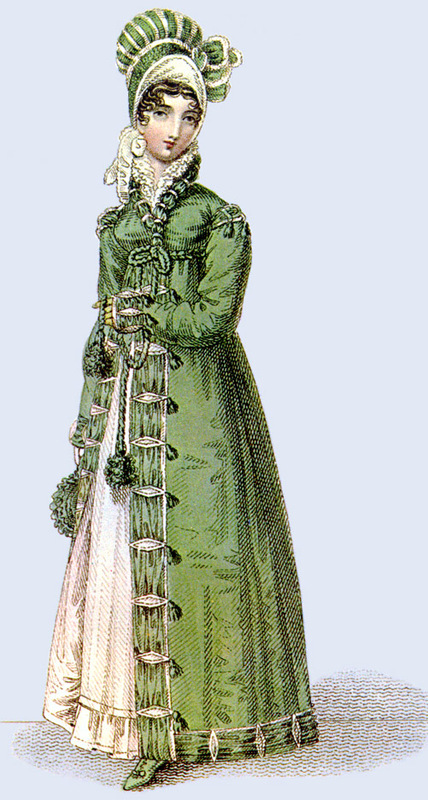 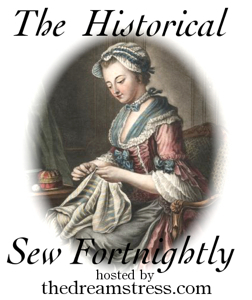 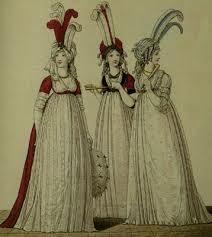 The dress I wore was the HSF Striped regency gown, matched with mittens, fichu and an shawl. 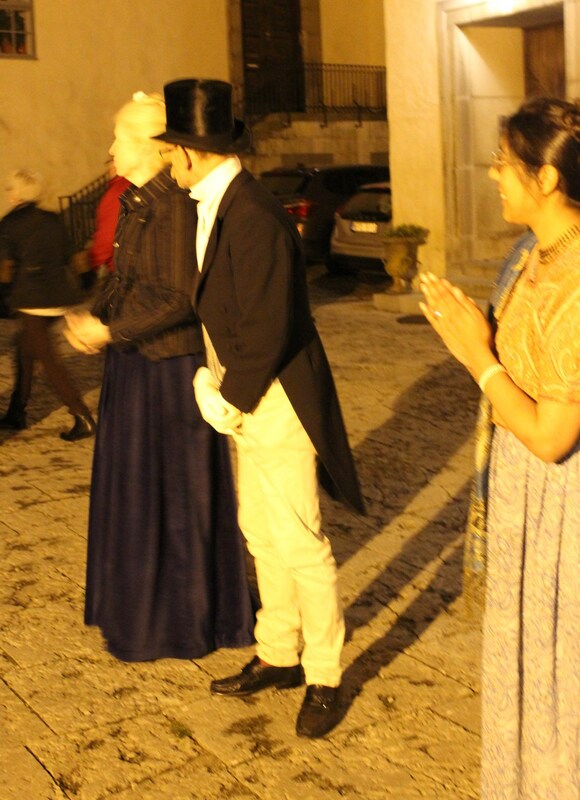 The dinner went well, and the dancing even better, with lots of on-lookers and applaudes. 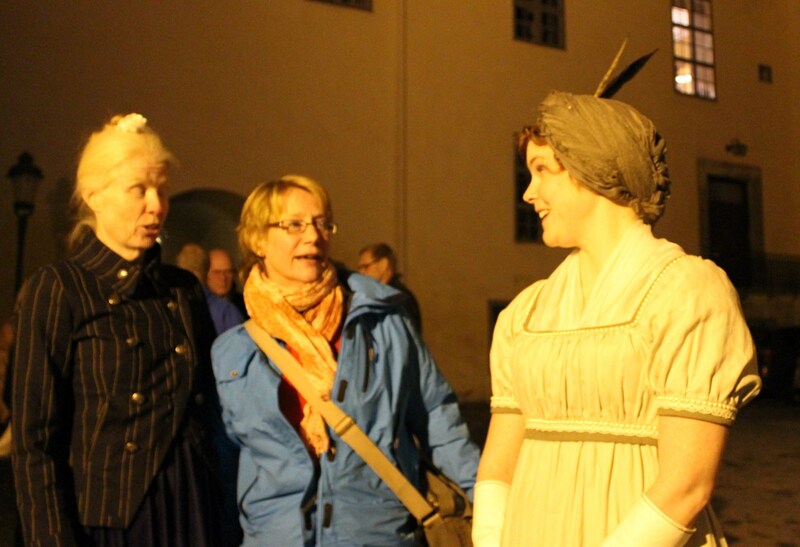 Ladies inside warming themselfe before the dancing. 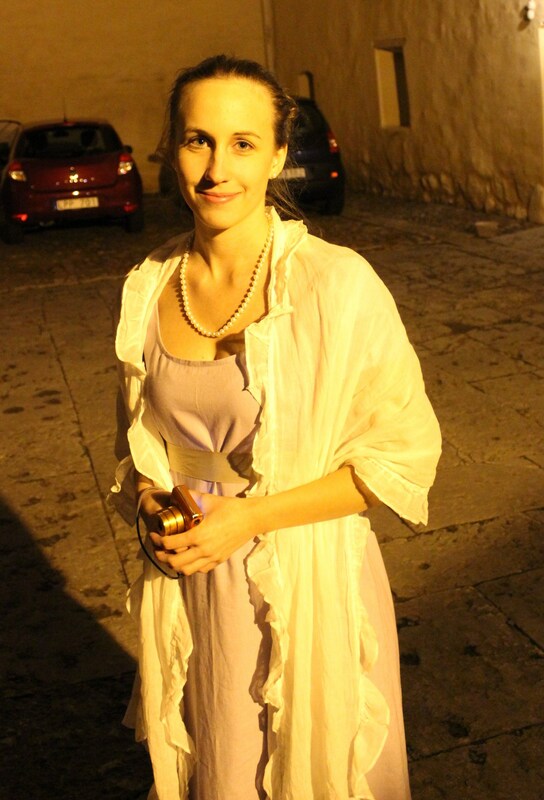 Anna, looking lovely in the dress she made herself for a prevous event. 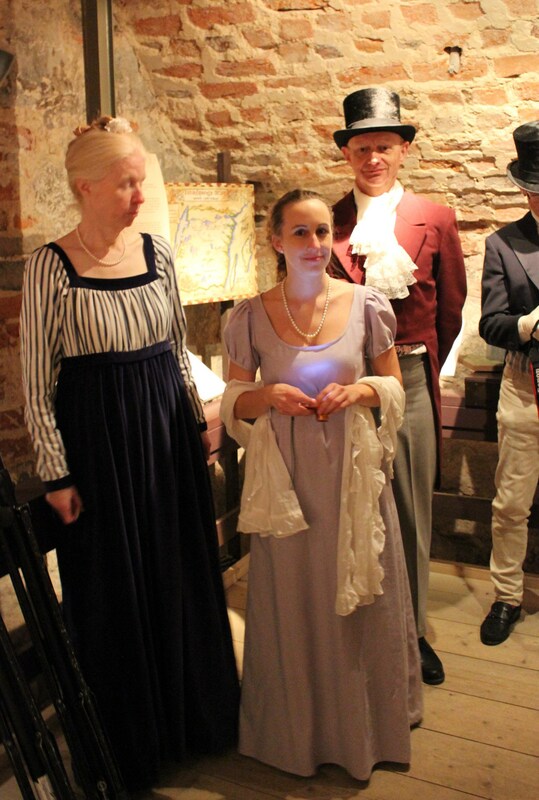 Me and Solveig. 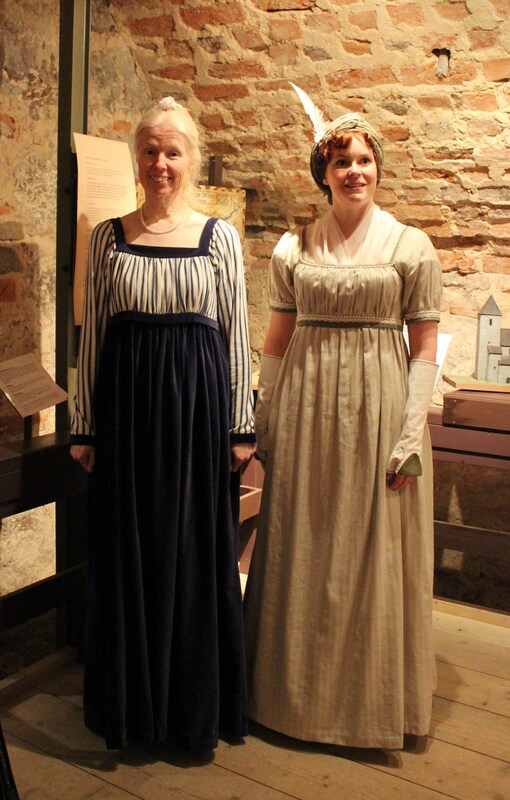 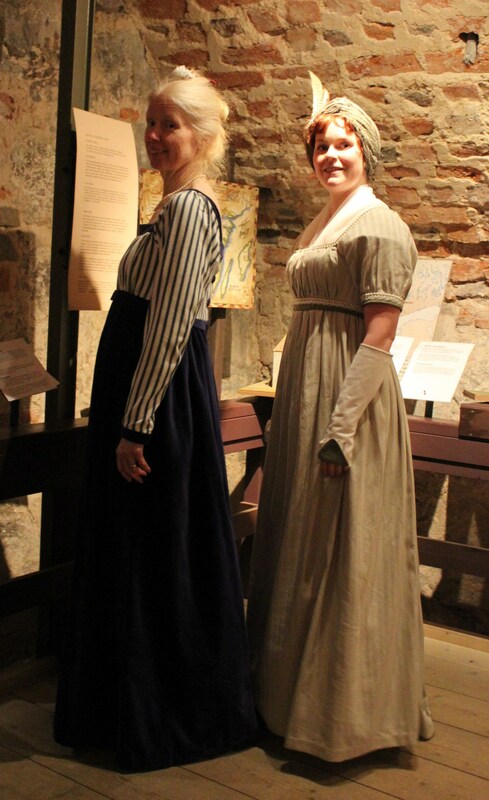 I made both our dresses this past year, from the same pattern (Reconstructing History nr 838). 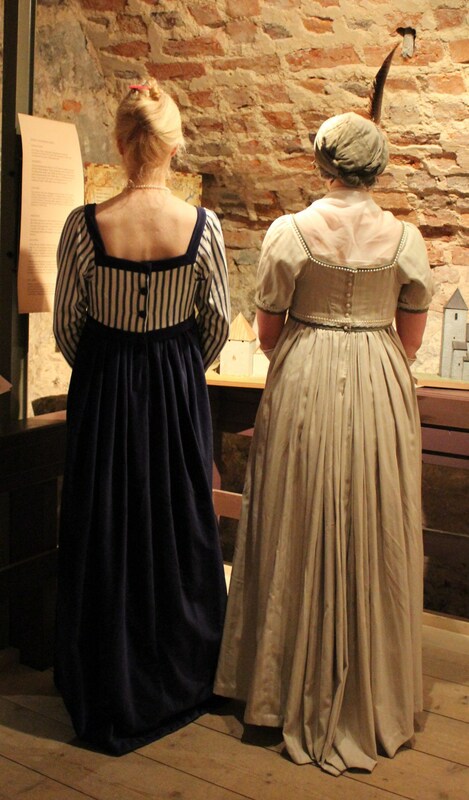 I found it exiting to notice the differences between the dresses and the way they look being worn in two different ways.